This article by Karni Eldad has been edited and translated from the original Hebrew version. Special thanks to the widow’s cousin, Efrat Razel, for her assistance with this post. That day, the Village Baker pedaled on his bicycle. He was unusually distracted. He thought about the bread dough that was rising, about his house that was being built, about his new distributor in the big city and all over. The Village Baker made a wide turn left and rode towards his bakery. It was Friday, the most stressful day of his week. Everybody wants bread, and the demand for his special bread was growing from week to week. We were no longer just talking about twenty loaves on the rickety table by the village store. On the way to the bakery he stopped by his neighbors’ home to give them some pesto spread he had made. For no special reason. Just so they would have something tasty to eat on Shabbat. The Village Baker had black curly peyot that he slid behind his ears. He had a beautiful wife and three children: 8-year-old Tsviel, 5-year-old Emuna, and 2-year-old David Yosef whose first haircut would take place exactly a month later. The Village Baker had good neighbors who loved him and he always greeted them with a smile and a shining face. Once a newcomer came to Tekoa and the Village Baker greeted him with his shining face and spoke with him as though he knew him. “Do we know each other?” the newcomer asked. “Now we know each other,” the Baker replied. When a new baby was born in the village, the Baker would take his mandolin and play joyful songs at the simcha. For no reason, just so that people would be happy. The Village Baker had an especially deep voice, and sometimes he would serve as the cantor on Shabbat and holidays. Sometimes he would sit with his friends on the grass and sing and play, while the children played around him. The Village Baker. With his bread, Hillel chose to perform acts of kindness. When stores would return loaves that had not been sold, his wife noticed that he was mysteriously happy. Afterwards she found out that with a wide smile and shining face he would distribute those loaves to the needy people of the village. 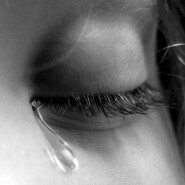 There was once a tragedy in the village; two parents passed away in one year. And for a long time Hillel would bring bread to feed the orphans three meals a day. The village baker, Hillel Rudich z”l, my dear and beloved neighbor, died that Friday last month without knowing he was going to die. He died of a heart attack while he was playing with his children, in the water, in the desert. Nobody knows why. He died a pure death. Clean. Simply death. There’s nobody to be angry at. There’s nobody to channel the anger and the shock that his leaving created. A 32-year-old man, at the height of his life, who didn’t smoke and ate very, very healthy food, and was in good shape, with no obvious reason that he shouldn’t return from his swimming trip with his children at the spring, and get into his car and drive home to welcome Shabbat. 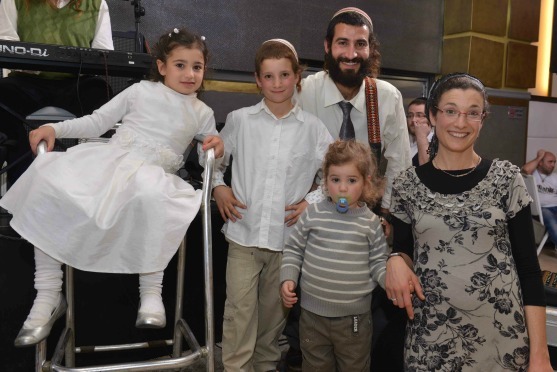 Hillel z”l and Hadas Rudich with their children this past spring. The worst scene you can see on a yishuv is when the neighbors gather together, and speak quietly. Whoever lives on a yishuv is familiar with this scene and trembles from it. It’s a chronicle of tragedy: the shiva and the crying and the incomprehensible pain of the final moments before they tell the family. It’s a chronicle of the crumbling of the comforting routine, the joy, which doesn’t actually exist but which we hold onto as though it’s real. The truth is that each of us could die any day. And therefore the only choice and the final lesson I learn from the Village Baker is to love. To live every day and to love every day. My husband. My children. My parents and my siblings. To love what I am doing since I am going to die and it’s a shame to waste time. To live with focus. And with positivity. And mainly, to love. To give to others. A lot. Without keeping track. To play music, to make people happy, to feed people, to play, to live. Thank you Hillel. For everything. We will take care of your wife and children. You can pedal around Paradise with a quiet heart, and take wide turns, and smile your sheepish smile in Heaven. I think of all of our voices, meaning well each from her own standpoint, raised in heated “debate” over two different posts appearing on this blog in the last week. And then I read this article. And I KNOW that ALL OF US are surely united in this – our love for Hashem, and our love for such precious souls such as this Village Baker who lived a splendid life of modesty and chessed and good. I KNOW that we are united in our tears as we read this article, and that too we are united in our genuine desire as Rosh Hashana approaches, to be more like this Hillel z”l – to do more chessed, to live closer to Hashem’s WIll, to bring somehow, through Hashem’s mercy, a little more light to this earthly world. I think imho that this is the “bottom line” – that truly we are all united in our recognition of good and our hopes to live more loyally to that good – each in her own way, choosing her own particlar derech…. and this is what we hope most for our children. I think we will all feel humbled and inspired by this man’s love and life/// we will BSD better understand that the truth of a person’s deeds and being are more significant and real than anything else. I do not know why you posted this article on this particular day, but I thank you profusely. It certainly reminded me of the chodesh of teshuva and brought peace in my heart for all Jewish Mothers – no matter how similar and how different they are from me. As Rebbe Nachman teaches, the heart of teshuva is accepting humiliation in silence, with no response. May we all look in the mirror and see ourselves as we really are – with our nekudot tovot and our failings… and then be silent (not silence as we may assume – for this is surely a time of confession and speaking as much and as truthfully as we can to our Maker BSD)…. and on Rosh Hashana – as we sink so low in shame for our sins, may we feel our souls soar high as our faith assures us He is the King and He is endlessly forgiving. Thank you Hillel z”l for bringing peace and love to our hearts. May your widow and beloved children be comforted amongst all the mourners of Zion. My son’s death had much in common to Hillel the Baker. David was 47, known by many for his chesed, love of being a Jew, great husband, father, and so much more. The funeral was packed, so much love, so much to miss. What could be Hashem’s reason for taking him in almost a blink of an eye? I asked the Grand Biala Rebbe in Jerusalem and he said that some people fulfill their mission in less time than most people. So did Hillel the Baker and so did David Carasso. For reasons we will never know, their saintly souls fulfilled their mission and they were ready to bring added Holiness to Shamayim. Thank you for a beautiful story.